The 2015 December World Travel issue of Motorcycle Mojo is here! We’ve searched out stories from travellers around the globe and compiled them in one incredible edition you won’t want to miss. Explore the vastness of Mongolia with editor, Glenn Roberts as he marvels at this motorcyclist’s playground. Take in the diversity of the Chilean countryside and get off the beaten path with a pair of adventurers traveling the Dictator’s Road. Next, sample the rich history of Eastern Europe with Mojo’s own, Costa Mouzouris as he rides around the ‘Bloc’. And then, we’ll check back in on John Nomad’s around the world journey for an introduction to Japanese culture and tradition. From there, it’s only a short hop to the island of Oahu for a relaxing Hawaiian family vacation, but our author is looking to make an escape for some time in the saddle and an ocean view. Lastly, we’re off to England and Scotland where Sean Wiesner fulfills a long-made promise to his grandfather by recreating a 75-year-old journey around the Isle. 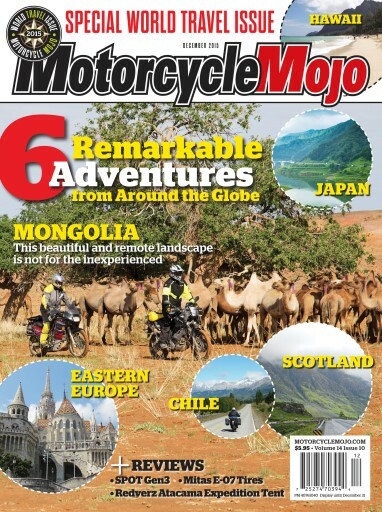 All this and much more in the December World Travel issue of Motorcycle Mojo.